Boston’s True Bistro — Protecting Animals And Our Planet, One Bite At A Time! The Boston area hosts several fine vegan restaurants, but True Bistro located in Teele Square in Somerville, Massachusetts, stands above the others. Opened in 2009, it has become a destination eatery that is distinguished by a calming ambiance and an eclectic menu that offers something for everyone, whether vegan or not. 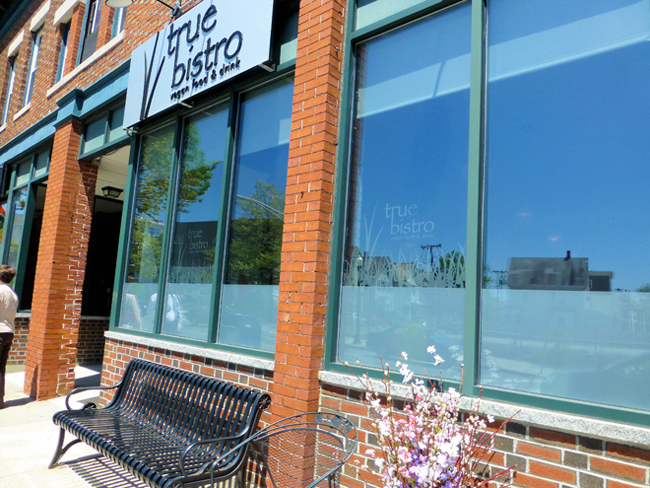 True Bistro: Awarded Boston’s Best 2014 by CBS Boston! True Bistro is situated on a busy downtown street but as you step through the door, you leave all the hustle and bustle behind. Although the dining room is small—it holds around 40 people comfortably—the high ceilings and large, light-filled windows give the impression of a spaciousness that belies its actual size. Original paintings dot the wall near the entrance, small vases of fresh cut flowers adorn the tables, and soft, soothing music sets the tone for a peaceful, unhurried meal. It is apparent that owners Michael and Linda Harrison have taken great care to create a tranquil environment where patrons can relax and feel welcome.